Its a case of SITUATIONAL irony, something you wouldn't expect to happen occurring. Like an Olympic swimmer drowning in the bathtub, or a statue that says freedom being fenced up. Are you trying to say that this is like ten thousand spoons when all you need is a knife? Wait! You mean the fence is made of iron? I guess that would be irony, but I don't think that's a word. They haf to put up the fence because the locals kept defacing it. 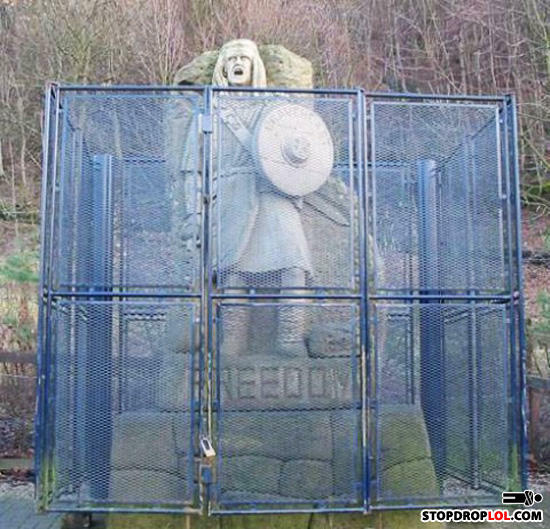 Stupid local council didn't ask them if they wanted a statue of Mel Gibson. In Sovjet Russia, Freedom fences you!